One of the most memorable random acts of kindness happened to my son as we were walking at Ala Moana Center. We paused outside an ice cream store, debating if we should reward ourselves. An elderly man stopped and gave my son a dollar, telling me to buy him an ice cream. I tried to refuse, but he just smiled and walked away. A random act of kindness that happened to me: I was in the Home Depot parking lot and felt faint. A kind man helped me up, and a thoughtful woman even brought me a can of Sprite. Another time, I was standing in a long line at a tire center. I had left my phone at home, but a nice man let me use his phone to call my husband about which tires we should order. Being kind doesn’t mean giving someone money or buying things. Most of us try to be kind every day, as part of living with aloha. We hug our children, our parents, and our friends. We wave to our neighbors. We smile as we pass people. We wave to drivers who let us into their lane. During Random Acts of Kindness Week, February 9-15, let’s challenge ourselves to be more kind, more considerate, and more spontaneous. Step out of your normal routine or comfort zone and attempt a new random act of kindness each day. As you celebrate Valentine’s Day, think of ways to make the people in your life feel special. 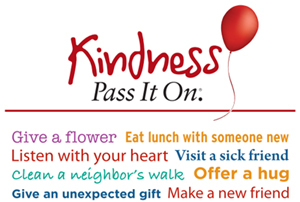 * Get inspired with kindness ideas on the Random Acts of Kindness website. Search ideas by category (work, family, school, sports), by cost, and by time investment. * Teachers and parents can print posters based on 12 kindness concepts: assertiveness, compassion, gratitude, caring, fairness, self-care, self-discipline, responsibility, respect, perseverance, integrity, and helpfulness. There are printable bookmarks, free lesson plans, writing prompts, and kindness projects for all grade levels. For younger kids, there’s Operation Kind Kids, put together by the preschool channel Sprout – with ideas, a kindness counter, and activities. * Individuals who want to challenge themselves can print a kindness calendar with daily suggestions for acts of kindness. Each month features suggestions based on one of the 12 kindness concepts. * Share acts of kindness, whether you saw a random act of kindness or were the recipient of a kind act. Every Wednesday, KHNL and K5 News at Nine feature a Random Act of Kindness recipient of the week. Oahu residents can nominate someone and share their story. Or tell your story to the Honolulu Star-Advertiser, which features a “Kokua Line” where you can share your “Mahalo.” Email kokualine@staradvertiser.com. Have you ever done a random act of kindness, either planned or spur-of-the-moment? Have you benefited from someone’s selfless kindness? This entry was posted on February 10, 2015 at 5:00 am and is filed under Community. You can subscribe via RSS 2.0 feed to this post's comments.